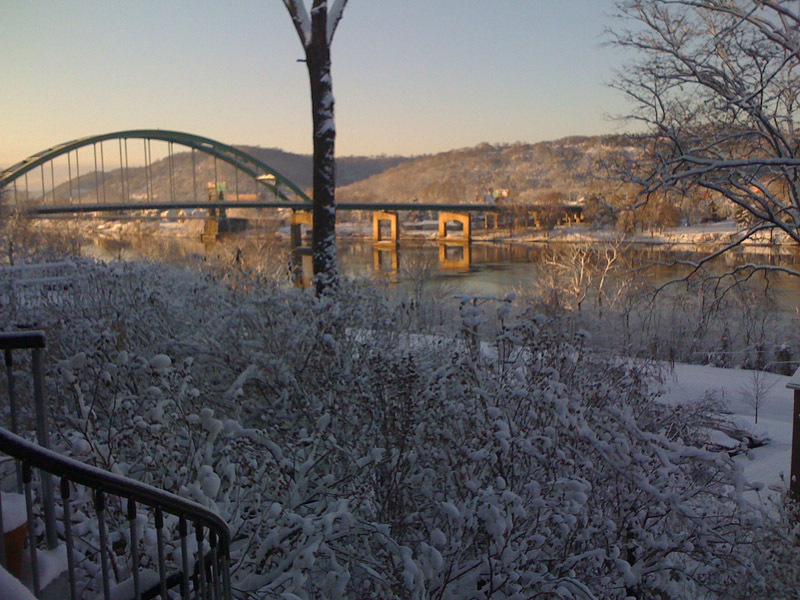 Who wouldn't want to live in Wheeling? NOV. 2017 UPDATE: Once again Wheeling's North Main Street neighborhood has been recognized nationally as one of the best Main Streets in America. The National Life Insurance Group identified a single Main Street per state, and for 2017 ours in Wheeling was selected. I see one error - it says that we have houses as old as 1837, but the oldest known is 1831. No one locally seems to have been contacted by the National Life group, although they link to this blog and they used Joanne Sullivan's pix from Flickr. Hooray to us! I am interested in the history of this small city and needed a place to organize and display information about it. 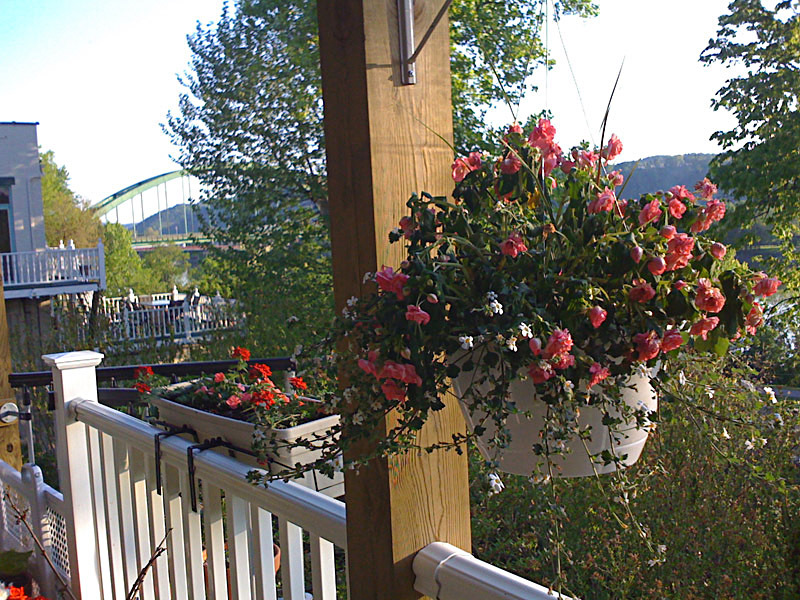 I am especially interested in architecture and will add pictures of various buildings, bridges and other structures. To me the word historic encompasses almost everything - remember history here started with the most ancient rocks and extended to yesterday. 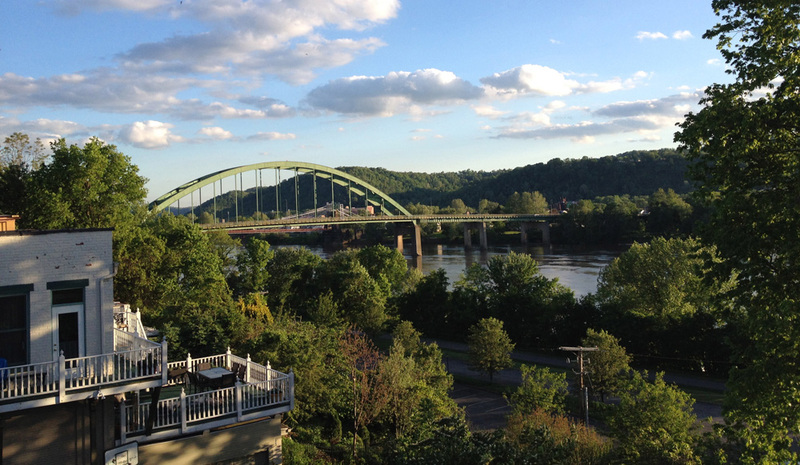 If you are interested in the early American frontier, Victorian architecture and 19th century commerce, Wheeling is a great place to visit and live! A wiki is an easy to use web program that allows - encourages - everyone to add comments, photos, maps and anything else related to the topic. In order to reduce destructive posts - you can erase everything! - registration is required to make changes. But it is easy and free to register. So look through the wiki (click the orange words to the left) and if history interests you please make some contributions! Old postcards are wonderful documentation of old buildings, boats, events, etc. Currently, I am adding those from the massive collection of Chuck Julian, but if you have any, I'd be happy to borrow them to scan and add to Historic Wheeling! Mt Wood Cemetary now listed on the National Register of Historic Places! Thanks to Bekah Karelis for preparing the nomination! 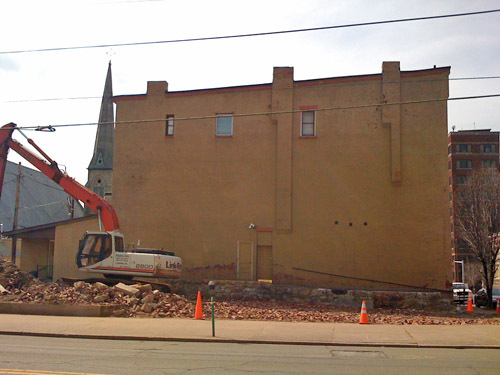 I just finished bemoaning the loss of elegance in Wheeling (in a description of a garage! 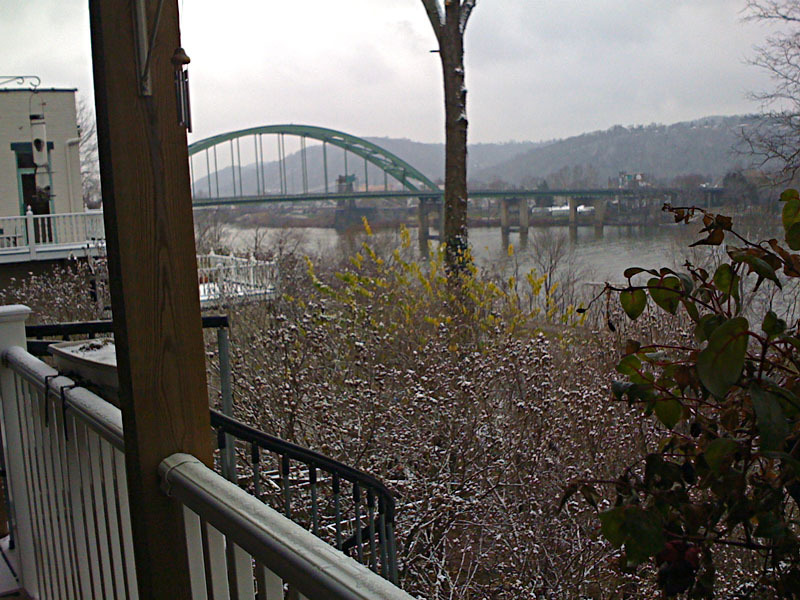 ), but then I looked up from my computer monitor, out my house's rear windows to the Ohio River and iridescent green lawns on Wheeling Island, with the hills of Ohio beyond and scudding white clouds in the sky. My god, what a beautiful landscape this is! According to the citation, "Wheeling offers rugged good lucks, Victorian architecture, a solid economy, and an enviably mild four-season climate. It also offers great golf, riverboat gambling and top-notch shopping, while being safe, affordable, quiet and sophisticated." This is mostly correct, but our gambling is on Wheeling Island, not on a riverboat. 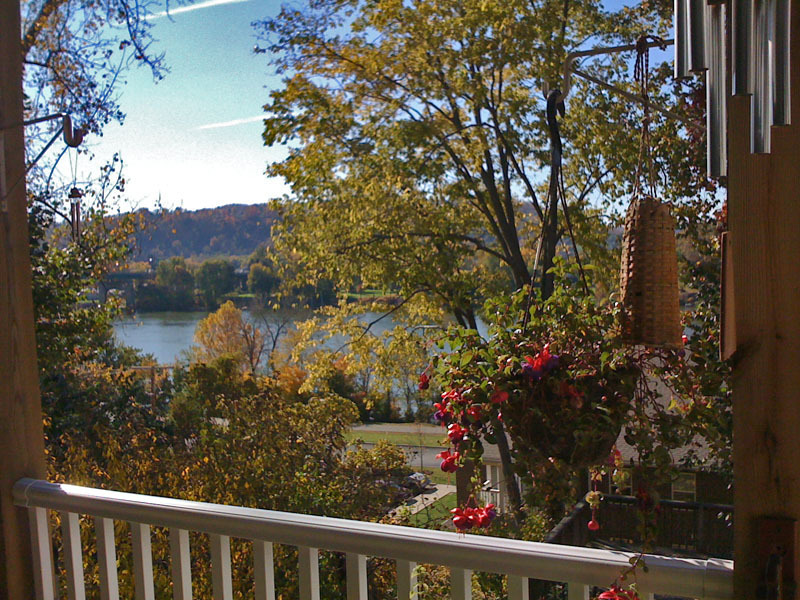 The American Planning Association just released its picks for 2009 of the Great Places to Live in America. 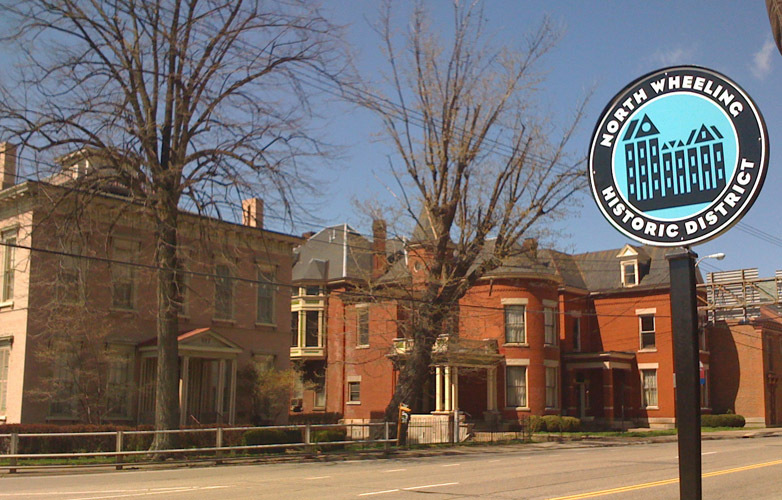 North Main Street was selected because it includes one of the greatest concentrations of mid- to late-19th Century Victorian-era residences for a city of this size. Its great to see professional planners recognize what is obvious to those of us who live here! the number of county projects awarded a federal preservation tax credit. Wheeling is 3rd, behind Shirley, MA (near Boston) and Woonsocket, Rhode Island. ePodunk recommends that each of the historic towns is a great out of the way destination for historic travelers, and Every stop begs visitors to experience a unique sense of place. I agree, but you better visit soon before all the old buildings are torn down - see below. 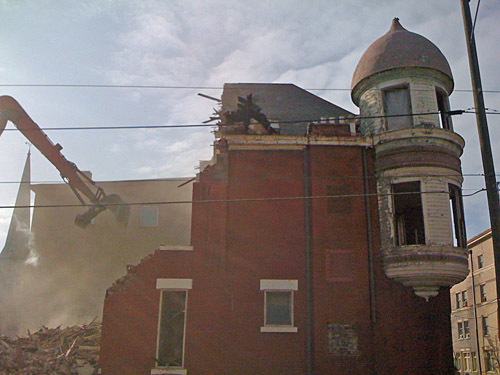 Beautiful building demolished today, Jan 30, 2010 - why? I bet the cost of demolition could have covered getting it back into shape for another 100 years of use. Dec 19 Wheeling was on the western edge of the great East Coast storm, but we had to wait to this morning for Sun to come out and illuminate the beautiful scene. Gray day, brightened by the first snow dusting of the coming winter. Is this Really Fall in North Wheeling? This page was last edited on 4 May 2018, at 15:17.